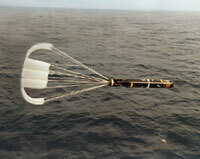 The US-designed Harpoon is an extremely powerful anti ship missile that is carried in the bomb bay of the Nimrod MR2. The air to sea version of the missile has extremely sophisticated Electronic Counter Measures (ECM), and the ability to fly a sea-skimming course on a dog-leg path through three pre-programmed way-points. The warhead is extremely powerful and a hit from Harpoon is almost certain to result in the destruction or disablement of a major surface vessel. Sea-skimming cruise monitored by radar altimeter, active radar terminal homing. Stingray is a lightweight homing torpedo that is carried in the bomb bay of the Nimrod MR2. The torpedo is fully programmable with a number of search options and has been designed to destroy submarines. The torpedo seeker can either home in on the sound of the submarine or detect and track the target using its own sonar. From 2003, Stingray was upgraded to Mod1 Standard. The upgrade includes new digital homing, guidance and control systems and delivery of the upgraded torpedo commenced in 2006. Sting Ray first entered service with the Royal Navy and Royal Air Force in 1983, and there are plans to extend its life through regular upgrades thereby ensuring that the weapon remains in service until about 2020.